Image caption Saudi Arabia blamed the killing of Jamal Khashoggi on a "rogue operation"
Jamal Khashoggi - a well-known Saudi journalist - went into his country's consulate in Istanbul on 2 October to obtain a marriage document and disappeared. 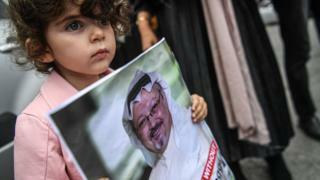 After more than two weeks of denials, Saudi Arabia eventually admitted that he had been killed within the consulate in what officials called a "rogue operation" and has vowed to punish "those responsible". After his dismissal he moved to London and later Washington to serve as a media adviser to ambassador Prince Turki bin-Faisal, Saudi Arabia's former intelligence chief. In 2012 he was chosen to lead the Saudi-backed Alarab news channel - touted as a rival to the Qatari-funded Al Jazeera. He also alleged the Saudi government had pressured the publisher of Arabic daily newspaper Al-Hayat to cancel his column and said he was told to stop tweeting to his 1.8 million followers after he cautioned against the country's "overly enthusiastic embrace" of then US President-elect Donald Trump in late 2016. "I have left my home, my family and my job, and I am raising my voice. To do otherwise would betray those who languish in prison. I can speak when so many cannot. I want you to know that Saudi Arabia has not always been as it is now. We Saudis deserve better," he wrote. Khashoggi's most recent piece was published on 11 September, and the Washington Post published a blank column on 5 October to highlight his disappearance. The conflicting Saudi accounts over the incident have angered the kingdom's Western allies, and shaken their ties with the world's top oil exporter. 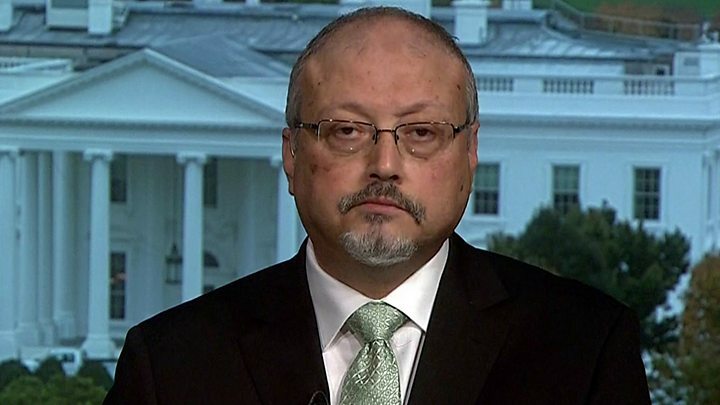 Just three days before his disappearance, the BBC's Newshour programme interviewed Khashoggi off-air. In a released audio snippet, he said he did not think he'd be able to ever return to his native country. "The people being arrested are not even being dissidents, they just have an independent mind," he said. "I don't call myself an opposition: I always say I'm just a writer, I want a free environment to write and speak my mind and that's what I do in the Washington Post. "They give me a platform to write freely and I wish I had that platform in my home." "This serious transformation that is happening isn't discussed - the Prince supplies us every couple of weeks or couple of months with a huge multi-billion dollar project that wasn't discussed in the parliament, wasn't discussed in the newspapers and the people will just clap and say great... and things don't work that way."